So you want to start with a challenge that is realistic and doable. Set a challenge for yourself that you know that you are able to do. I would caution you over picking a challenge like cleaning up your whole apartment over a day or weekend or even cleaning your bedroom might be a little ambitious. You may need to break these down into smaller manageable steps. So, we need to start small but with something that you are going to see an immediate difference. Cleaning off a part of the counter in your kitchen. 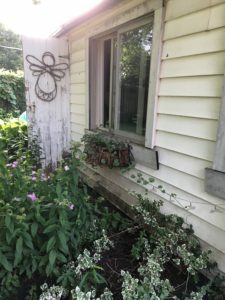 Gardening – I love this one if and when I have the time. Pick something that is somewhat challenging for you but also realistic. Perhaps it is something that you have been procrastinating about or an area that has been causing you some stress. Timely – goal has a target finish time attached. Depending on how much time you have you can set 1 – 5 (or really whatever you think you can manage for the day considering whats going on with your life, energy, commitments, time, etc.) It really helps to write them down. 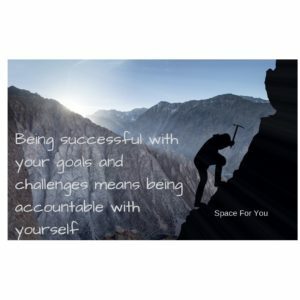 And if you can be accountable to yourself and also to others you will be more successful. Awareness and letting go of the Clutter. Not easy to do as we tend to be on autopilot most days (myself included) but if we can start to examine what our thought process is as we do this work, we will start to see where we are stuck and how to move forward. Awareness is a big topic in the Clearing Clutter Support Group and happens immediately with week one. Often around week three or four we ask members to bring in items from home that they know they want to let go of. Not something that is easy but something that they are experiencing some conflict over. They know they want to declutter but something stops them from doing so. I really love doing this exercise in the group as there are always so many great ah ha moments. The first participant to share brought out a bag of jewellery that was handed down to her by family members. She said it was jewellery that she wouldn’t wear and had no one else to actually pass it down to. She also had a silver pie server and spoon which would need to be cleaned with silver polish. She did not know who this came from and said that she would not use these. This participant shed a few tears as she felt the attachment to these items but also felt good about passing them on to a program that makes new items out of old jewellery and other items. Often being able to donate to a good cause can help. Another participant had an unopened boxed gift that had gathered a lot of dust and had been given to her from a young niece. It was a little wooden character that holds your glasses. This group member said she loved the gift because it was given to her by her niece but she won’t use it because she doesn’t wear glasses. After answering many questions she decided to repackage this gift and give it back to her niece at their next visit. The third example was a gentleman who had a big pile of Shoppers Drug Mart gift cards. At first we all thought they were worth money but actually they had been purchased in order to receive more Shoppers Drug Mart Optimum points and they were used. Why he kept them is hard to understand, perhaps they had become invisible to him or he kept them as a reminder that he had purchased them? He did talk about how he can be lured in with marketing to try to get as many points as possible. In the end, he was able to discard all of these into the garbage bin. 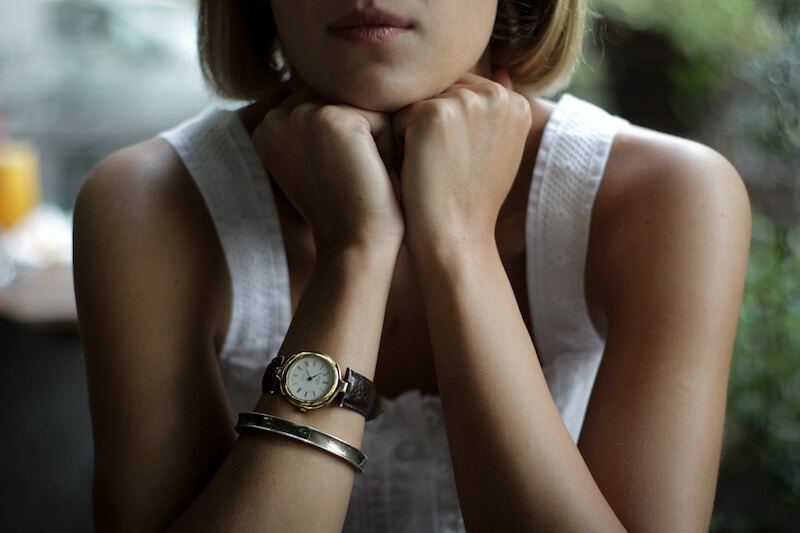 Individuals become very aware of their time, energy, stuff around them, triggers, emotions and behaviours. Taking the time to really notice what is going on with your thoughts and feelings will be helpful for you as you continue to do this work. This is always the first step and will then help you with what you end up doing with your decluttering efforts. Paying attention and having awareness is your key to starting this process. Please comment below with any thoughts or questions. Thank you for following along and Happy Decluttering! Saying yes to yourself sometimes means saying no to others. There are times when you need to put yourself first because you deserve it and are worth it. Setting limits and boundaries with others and learning how to say No will help you to stay true to yourself. In the long run you will respect yourself and others will respect you as well. A win/win!! Do you ever feel like you are on auto-pilot with no time for yourself and find that you put others needs before your own? Do you ever schedule personal time for yourself? That can really be difficult for most of us. We often put ourselves last on the list and just hope to get a little downtime in our day. We might not even know what to do or what to focus on if we had the time for ourselves. Some of us might just prefer to be busy in order to avoid some of those negative emotions that might come up. What could you say no to in order to have more me time? If you find yourself feeling resentful about how you are spending your time, this could be a clue that your boundaries are being stepped on. Perhaps you find yourself saying yes and then kicking yourself wishing you had said No. If that is the case, the next time someone asks you to do something or to help with something, decide that you are going to take a bit of breathing space. You could say something like “I will have to check my schedule or even just saying “I will get back to you on that”. Going for a walk, meditating on it or just taking some time for yourself to think about what you really want to do might be helpful. For myself, I find when I do yoga (most mornings) I often feel inspired with some great thoughts and ideas for my day or perhaps some future planning. I often get some great ah ha moments during this me time. Actually, I believe that yoga gives me more time in the day. The same can be said for meditation as it helps us to slow down and to have some breathing space. Taking some time to breathe and regroup during your busy day can be beneficial as well. Check out this blog post for some ideas on how to be more grounded. 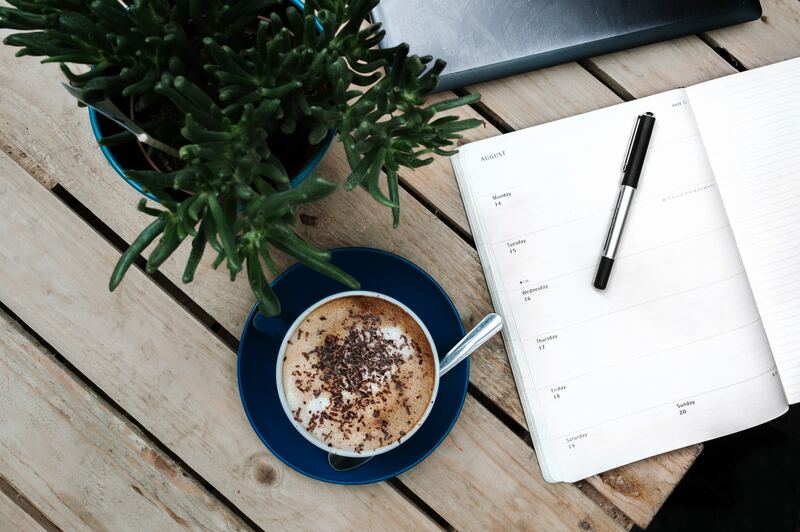 Maybe you have some personal de-cluttering or organizing goals that you have set for yourself but you just never seem to get to because other things always get in the way. This might just be a convenient excuse stopping you from doing this work especially if the things you want or feel you have to do are hard or just not fun. You might not have even thought of it that way. It is so easy to sabotage our own goals especially if no one else but ourselves know. Think about how this makes you feel about yourself over time? What could you do to honour yourself and put yourself at the top of your list? This is where some accountability can really be a benefit to help you to achieve your goals and to help you to make some progress with what you want for your life. There is still time to join us on the Facebook Group “Declutter Your Life and Mind” We are just starting Week 2 of the Six Week Declutter Your Life and Mind Challenge. Thank you for following along and I welcome any comments or feedback. 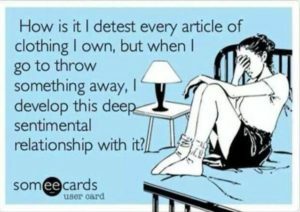 Happy De-cluttering! Weekly challenges that we set for ourselves can be the best way for us to move forward and to feel like we are accomplishing our goals and making progress. And having that accountability to ourselves and to others is so effective for keeping us on track. We encourage individuals to pick challenges that are doable and realistic. So, for example, it might not be realistic to think you are going to organize your whole house in a weekend, but perhaps you could get a couple of loads of laundry done and put away? Is there a small challenge you could set for yourself that will make an immediate difference in your life? 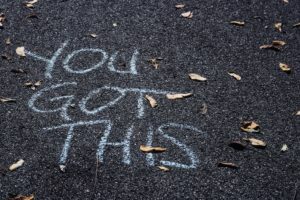 Is there something or a number of things that you procrastinate about from week to week that if you were able to tackle that item you would feel so relieved and free to move on to the next thing you want to do? No challenge is too big or too small. This work is truly life changing! You do not have to have serious chronic disorganization issues to participate in this challenge. In fact, I will be working right there along with you. This Challenge is for anyone who wants to do better in their life and wants to make some positive changes. Your challenge might be to work on physical or emotional clutter or maybe just to look at what emotions come up and what is holding you back. You get to choose your own personal challenges that are going to work for you. I hope that you will be able to join us on this life changing journey. Please comment below with any thoughts or questions and thank you for following along. Happy Decluttering! Here are some tips that I hope will help…..
Don’t Argue with your Loved One: Honestly, arguing is really not going to get you anywhere and it could actually be helping your loved one to make an argument for not changing. Also, it will just cause distrust and your loved one will probably dig their heels in and not allow you to even attempt to help anymore. Try to be aware of your language and work hard at not arguing, threatening, minimizing, judging, etc. Of course, if your loved one lives with you, you have every right to set limits and to expect that your wishes be respected. Otherwise there could be consequences to their behaviour. You need to be able to set boundaries and to follow up with them in a kind and consistant way. Focus on Values and Goals: Talk to your loved one about their values and goals. Be aware that these values and goals may not be the same as your own. Ask questions??? What are your hopes and dreams? What is most important for you to focus on in your life? What do you want for your future? Ask how acquiring more stuff and/or not letting go of items helps you to achieve those goals? Set Limits and Practice Self Care: This is challenging work for your loved one and also for you. You may need to set limits with your loved one. For example letting them know you are willing to help for a certain amount of time per week or that you are only willing to work on a particular task. Also, because this can be such difficult work, it is very important to practice self care and make sure that you are relaxed and in a positive space in order to help your loved one to make progress and to be making change. Please remember that hoarding disorder is a serious mental illness and often it takes a team of people to be able to help an individual. What do you think? Do you have any tips that would help you if you were in this situation? Please add your comments below. Thanks for following along. It is so much easier to stay in our comfort zone where we know what to expect and we don’t have to upset the boat. We really want to avoid uncomfortable feelings that may come up if we try to make some changes in our lives. We might worry about hurting others or not pleasing others and put our own needs on the back burner. Fear seems to be the buzz word these days. It’s all about the fear. Most of us have some real fear about letting go of clutter, both physical and emotional. What is this fear about? What will it mean for me if I no longer have this thing, this relationship, this activity, this habit, this addiction? Then what? The unknown is very scary. This is Emotional Clutter. I recently had to end a relationship that wasn’t terrible but I knew deep down that it was not working for me and I was feeling resentful and angry a lot of the time. I went back and forth thinking “this is really not so bad, there are some good things about this relationship” and “maybe, I just need to give it more time and put more effort into it to make it work”. I mentioned to one of my friends that it was good, not great and I really want great or it’s not good enough. She has been single for a long time and she said “I would take good over great right now if I could in my life” So, again, I was second guessing myself about this decision and the doubts kept creeping in. I don’t love the idea of being single and there is the worry that I may be single forever, but if that is the case I am okay with that. In the end, I knew I had to make this change in my life and even though it was difficult I am now single once again but much happier. Yay!! Update: I have been with my new partner for almost three years now and couldn’t be happier. I am so happy I took that step back in 2015. I am finally in love and its so real and beautiful. Back to letting go of other things…..Emotional Clutter…..anything that gets in the way of the enjoyment of your life or living your life to the fullest. This could be anything that takes up your time and energy and leaves you feeling resentful and drained. Things like unhealthy relationships, bad habits, old patterns of behaviours that no longer serve and activities that are not nourishing to your soul. It is challenging to change these behaviours especially if they have been going on for a long time. Getting rid of physical clutter will help to shift emotional clutter. If you are feeling particularly stuck, working on the emotional clutter is likely the best place to start. Clearing one, the other follows. So, how do we get past the fear and how can we work on our own emotional clutter? Know Yourself: This is where focusing on priorities and goals, and following your dreams can be so helpful and enlightening because it helps you to pave the way for what you want for yourself and for your life. Journaling, Visioning, Reading and Sharing with others are great tools that you can use to help with this. Challenge Yourself: It may not be as difficult as you think it will be. Usually the fear is worse than actually getting started. Start with small changes and see what happens. Pay attention to the emotions that come up. “Small is huge” is our motto in the Clearing Clutter Support Group. Feel the Fear and Do It Anyway: I love this expression and I know there is a book with the same name that I have read many years ago. 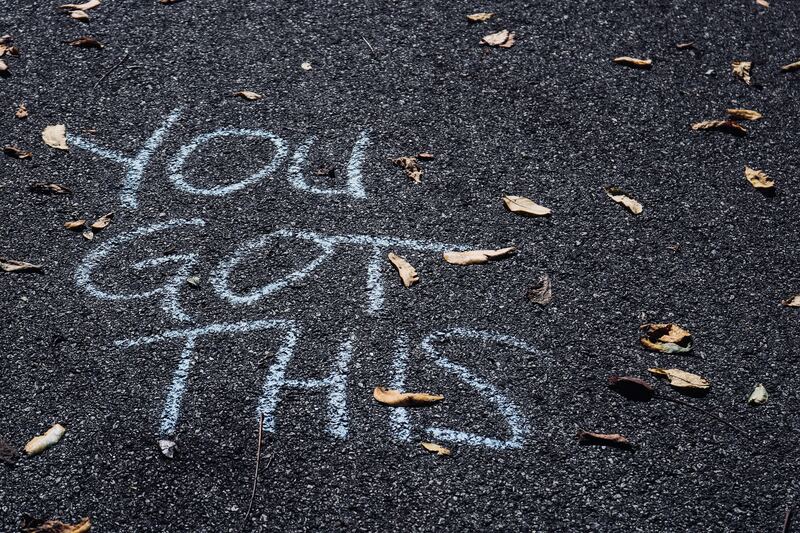 I tell my clients who have panic or anxiety attacks that (as long as they are in a safe place) when they feel an attack coming on and they know what it is they can try thinking “bring it on, give me your best shot” and going with it instead of trying to make it go away. If you can allow the feelings, emotions and pain and go through them rather than avoid this will lesson the power that they have over you. Trying to avoid the pain can make it worse. What are some of the benefits that you can think of for dealing with Emotional Clutter? Please comment below and share this with others who would find this helpful. Thanks for following along. Do you have a family member who is struggling with chronic disorganization? Have you tried to help them only to be left feeling frustrated and both of you feeling angry at each other? This is certainly a huge challenge that I am sure would not be easy to deal with. Sometimes the individual does not even see that there is a problem. 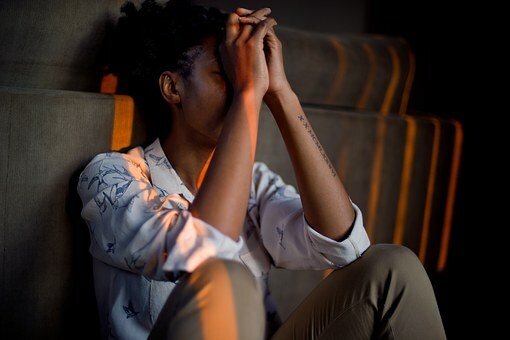 Family members who mean well want to help but their loved one is feeling defensive and has trust issues with everyone. 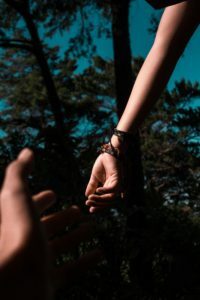 That is why it is a good idea for individuals to have other supports available and in more severe cases they may need a wrap around team approach. When a family member is resistant, it can be a matter of helping them to get to the point where they have done the minimum requirements to be safe and in some cases be able to keep their apartment or home. As a family member you can stress to them that you are concerned for their safety and health. So, how do you help your family member to be motivated? Are they having difficulties on a day to day basis with remembering appointments, paying bills, finding things, tripping over belongings or piles toppling over? What are the challenges they are dealing with every day? They might be feeling overwhelmed enough that they are willing to accept some help. What does your family member want to be doing with their days? What are their goals for the future? These are the clues for you to help them and to see how motivated they are to work on their issues. There is a great book that is directed at family members called “Digging Out” and it takes a harm reduction kind of approach. Here is some more information on harm reduction. Let your family member know that they are in the drivers seat and they get to make their own decisions. They get to decide on where to start or what to work on? This can be difficult for the person helping, however, there still will be opportunities to ask questions in order to help with the awareness of pros and cons of a decision or possible consequences. It is best for the individual to always be responsible for decisions around the clutter. Items should never be discarded without the individuals knowledge or permission. I have seen this happen too many times and unfortunately this just leads to more distress and dysfunction. Avoid doing the work for the individual and think about doing the work along with the family member. Show compassion and acceptance. I know how hard this can be, but to really help our loved one, we need to let go of any judgement and try to be there for them. Normalizing things as much as possible is really important. Making jokes, going out for coffee or lunch can mean the world to someone who is struggling everyday with clutter and chaos. Acknowledge feelings “it sounds like this is really hard for you”, “I can see you are sad about going through mom’s things” “its okay to be unsure about throwing this item away”, etc. Let them know that you realize this is really hard work and that you are proud of them for starting the process. We have a saying in our Clearing Clearing Support Group that is “SMALL IS HUGE”. Reward small efforts. 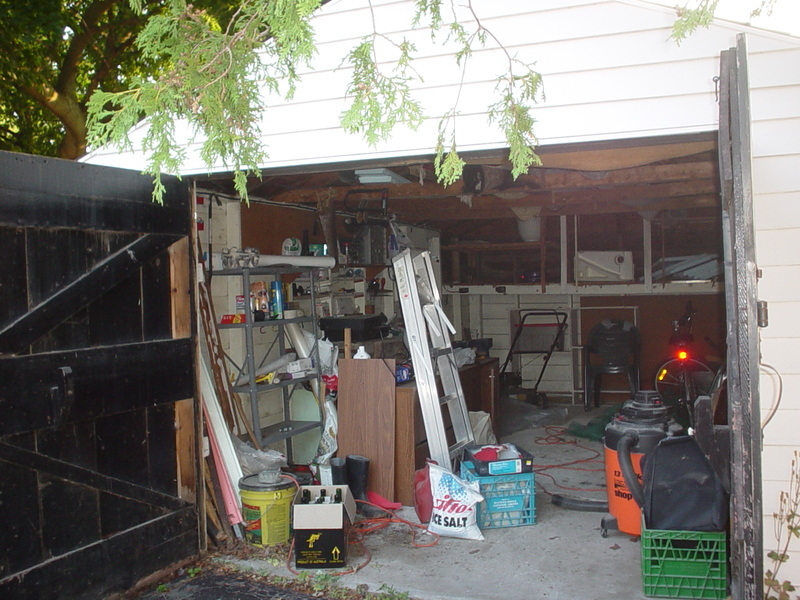 Learn more about clutter/hoarding issues. Read my blog posts for some helpful information or check out some of the great books available. I have some listed under resources. Also, if you are local (in London, On) come out to one of my talks coming up and bring your family member with you. Be kind to yourself. It can be really challenging to help someone who is struggling with hoarding. You will need to take good care of yourself and also work on setting healthy boundaries in order for you to do this work. Reward yourself. Please comment below with any thoughts, questions or ideas about successes you have had while working with others. I love change! Actually, I love doing renovations in my home and always have plans for how I can improve things. I love cleaning up my space and I am in my happy place when I have the time and energy to give my home some tender loving care. I am all about decluttering my home and also upgrading. As a Professional who works with people who struggle with clutter, you might think my home would be perfect. Not at all! I really like the lived in look and want my home to be a sanctuary, a safe place and also a place where I can relax and be myself. I like to have things around me that I am interested in, reading or working on. I want to be comfortable and at home. 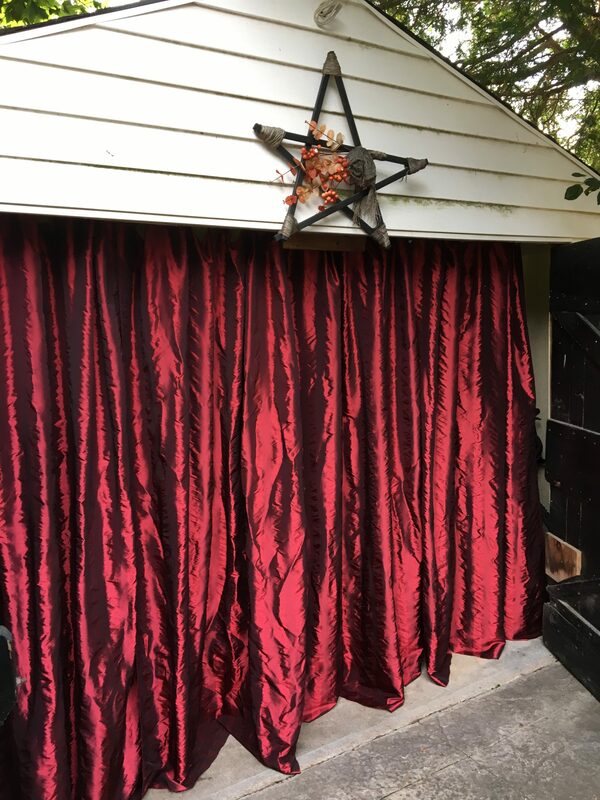 I am excited to tell you about my Grotto and my backyard space. Its really my most favourite place. Welcome to my Grotto. A grotto is a small cave, the kind of place where you feel comfortable, cozy, and protected from the harsh realities outside. A grotto can also be described as a secret location near water and because my space is near a pond, I thought this was the perfect name for this space. 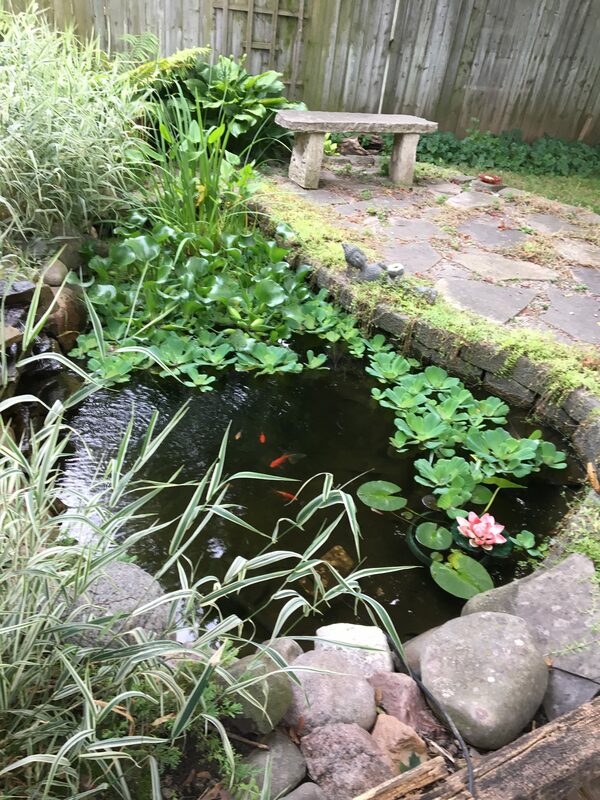 Here is a pic of my pond. 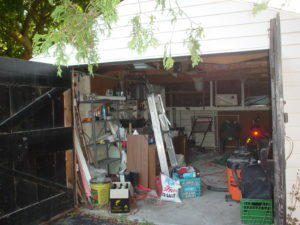 but with some determination and a focus on my goals this is how the space looks now. The grotto is a sacred place where women (well, it has been mostly women but we welcome men as well) can come to relax, be at peace, enjoy nature, sing, drum and share stories. We have had workshops in the grotto, birthday parties, girls nights, potlucks, visits with friends as well as a meeting with the POC London Chapter. 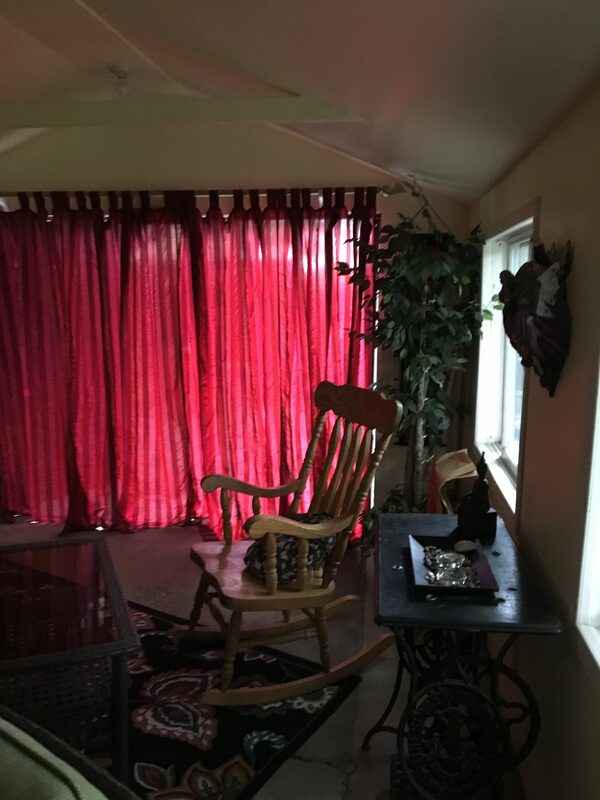 The very best time for a gathering is on a hot breezy night with the windows open, the curtains blowing in the soft breeze listening to the sound of the waterfall nearby. I really love a nice warm rainy evening in the summer. You are so close to nature and able to hear all kinds of nature sounds and wildlife. 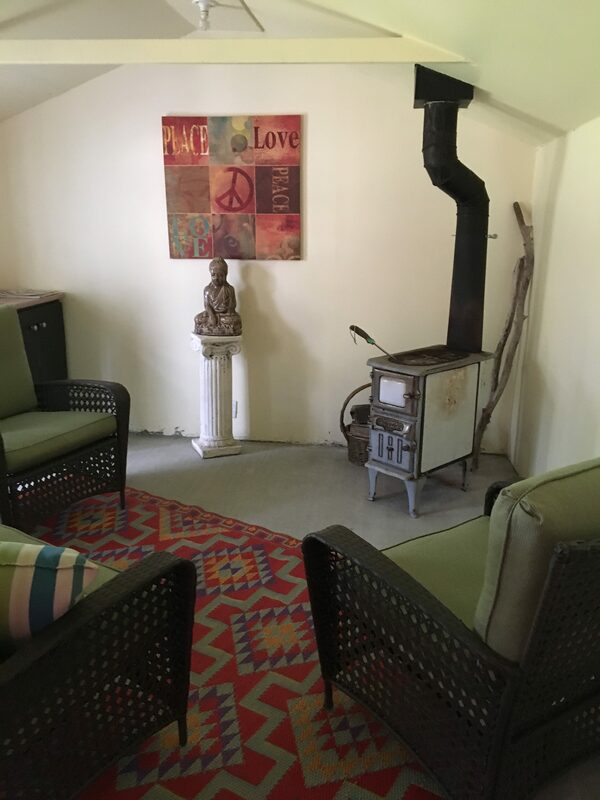 The wood stove takes the chill off on a cool morning or a chilly evening and adds a touch of ambiance. 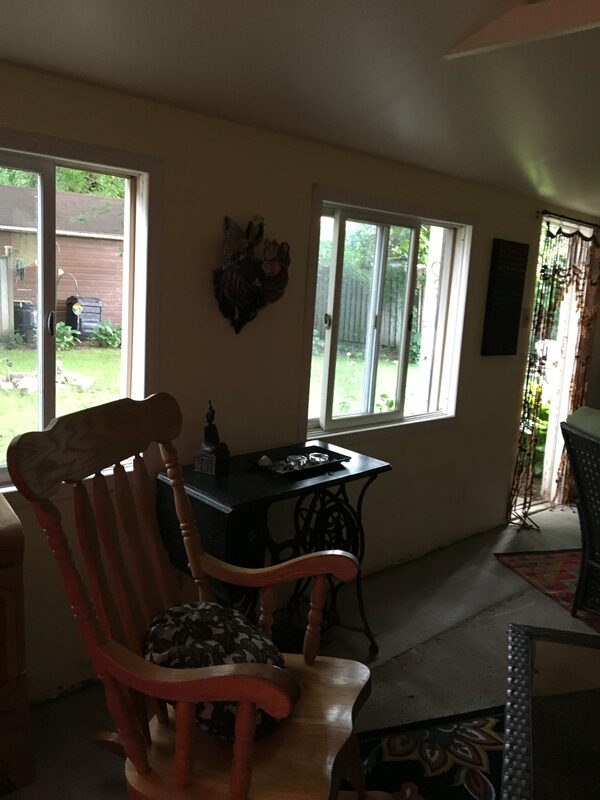 We spend almost all of our free time outside in the summer and can hardly wait to get out there to create a beautiful, peaceful and serene space. We look forward to our new adventures this summer. 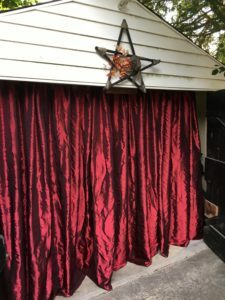 This post was created for the Professional Organizers Blog Carnival: A Sneak Peek Into an Organizers Home. Thank you for following along and I welcome your comments or feedback. Do you need some motivation to go through your clothing and de-clutter what you no longer wear, love or even fits? Are you having difficulty on a daily basis trying to figure out what to wear? Are you often running late, trying on clothes only to look in the mirror and think “uh, NO” only to throw it on the floor into a growing pile. UGH!! I had an interesting experience with a friend who helped me with some de-cluttering. It was really eye opening to be on this side of the fence and has been very helpful to me in working with others. My friend asked if she could look in my front closet? She had me try on some of the many coats I had in there. She would then ask me “what do you think?, “how does this make you feel”, “does it fit” and “does it make you feel like a queen?” In most cases, as I tried on each piece of clothing, I would shrug my shoulders and my response was “meh” and the item ended up on the floor in a pile. She said that if it didn’t fit or didn’t make me feel like a queen then it had to go. 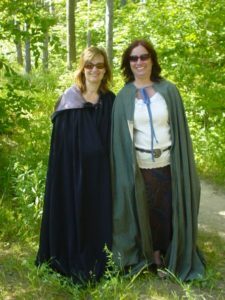 As I watched the growing pile for donation on the floor she asked me “from what is left in your closet, what do you have that makes you feel powerful and in charge of your life” I looked around and I had to say it was my cloak which she had me put on. I walked around a bit swinging my cloak and looking and feeling like a million bucks. I was really owning my space and the world. My cloak makes me feel like a queen and in charge of my life but of course I can’t wear that every day. Try on each piece of clothing. How does it make you feel? Does it make you feel like a queen? In charge of your life? If not, get rid of it. Clothing that needs to be mended. Are you going to get around to doing that alteration or has it been sitting in a pile for way too long? I got rid of a pile of clothes that needed to be mended because I just didn’t feel like spending the time doing it. Clothing from this past season that you didn’t wear? Why didn’t you wear it? As you know we wear 20% of our clothing 80% of the time. If you don’t love it, likely you won’t wear it next season either. Throw out anything that is looking old, with stains or broken zippers, etc. At the end of the season throw out old worn out boots or footwear. You are going to need new ones for next year anyway. Easy peasy, right? Sentimental items. It can be hard to let go of a piece of clothing, boots, shoes or a purse that you have really loved. But, if the item is old, worn out, doesn’t fit, etc. 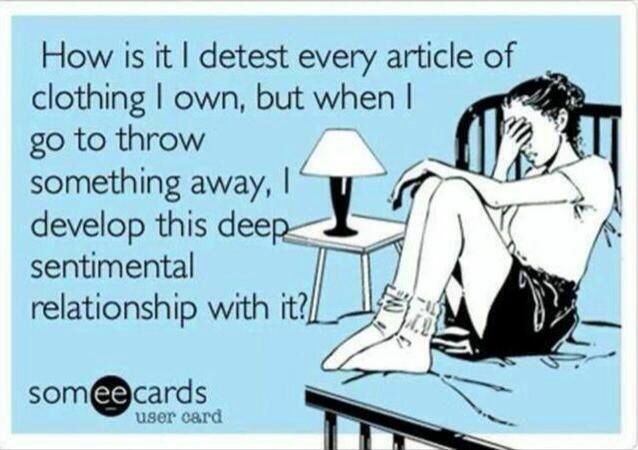 maybe it has served its purpose….thank the item and let it go. Take a picture if you are worried you will forget about the item. Going through your clothing will help you to see what you have, what you might need and also will give you so many more options for getting dressed in the morning.